Here we are again–National Pregnancy & Infant Loss Awareness Day or if you prefer, Pregnancy and Infant Loss Remembrance Day. It’s now been 5 years since my first miscarriage and about 4 1/2 since my second. I know this day is about remembering and honoring what was lost, but it’s hard not to remember without feeling the sadness and the sting that goes with it. Yes, I still look at the candles and wonder what might have been, but my heart also hurts for everyone else who has suffered. Someone very close to me endured a devastating pregnancy loss earlier in the year. I carry this child with me every day and I wish for all the world that he could be here. So these candles are for me and they are for her and they are for you. Remembering what was lost and hoping for dreams to be realized. I was out late tonight and by late I mean 8PM. I was tired, anxious, and more than ready to go to bed. I wasn’t going to write this post, this same post that I’ve been writing for the past three years. 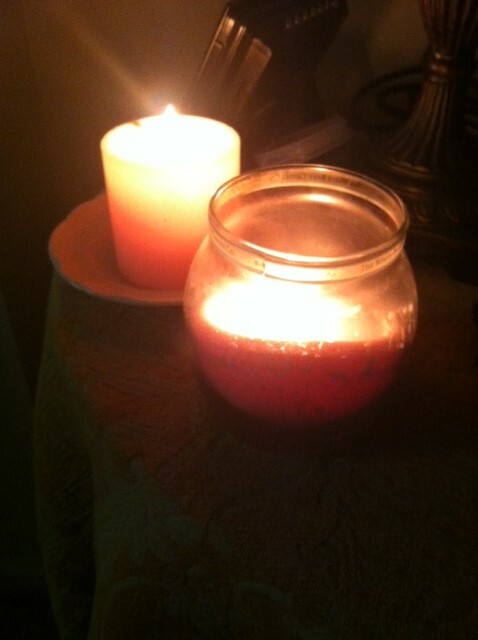 However, when I dug out these candles and lit them in honor of my lost babies, I instantly felt soothed. My lost babies. I said it. Not my lost embryo or my lost product of conception, but my babies. Lost early, but a part of me forever. For the first time, I can light these candles and not lose myself by the sheer weight of the sadness they represent. I can acknowledge and honor my babies, knowing they were real and that they mattered and still do. I am honoring their memories and it feels right and it feels okay.